In today’s business, meeting customer satisfaction is a must. Especially in the telecom business, companies are continuing their efforts to raise customer satisfaction based on stable communication infrastructure management. Customers have also identified ‘quality of communication’ as one of the most important factors when choosing a mobile phone carrier. However, with the advent of LTE, the pattern of network usage has changed drastically. Patterns that use large amounts of data, such as watching videos, have surged. Carriers who recognized it began to measure and monitor customer’s satisfaction. Telcos who have huge data will try to achieve customer-oriented paradigm shift through ‘data’. Here, we introduce a customer-oriented evaluation system through Metatron. 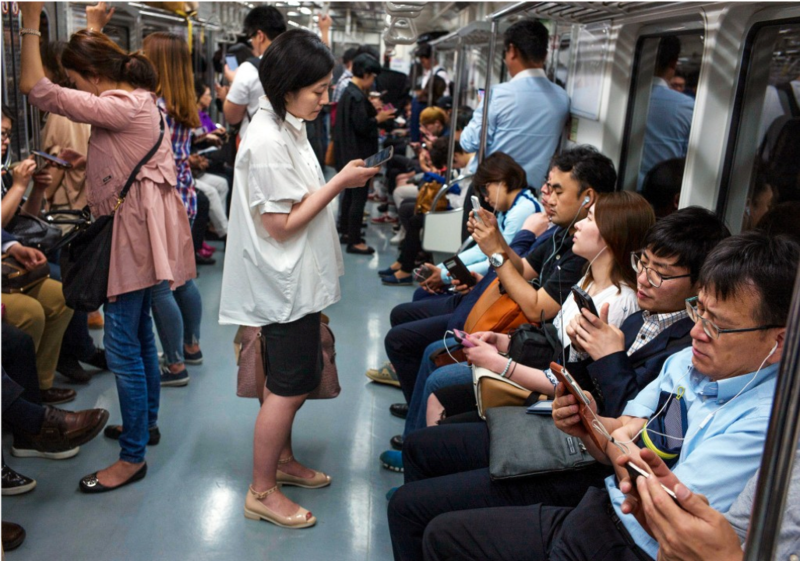 Recently in South Korea, with the activation of LTE communication network, customer usage patterns have changed due to increase of communication network usage. Customer satisfaction became all the more sensitive to data traffic with this change. Meanwhile, India has similar issues, too. India’s mobile communications market is growing more than 10% annually due to the explosive growth of subscribers and data traffic. Global telco B, headquartered in New Delhi, India, has tripled its national base stations over the past two years to accommodate the rapidly increasing data traffic. B, which provides mobile communication services to 20 countries around the world, has been continuously having issues with surging data traffic processing, network quality management, and base station operation in India. For this reason, it is very important to analyze customer satisfaction using telecommunication services, but it is not efficient to research and analyze manually because of the rapid increase of data and users. Therefore, the telecom industry is moving quickly to introduce a solution that can collect, analyze and visualize customer data in real-time to evaluate service quality and prepare for network failures at the same time. First of all, to shift paradigm from device-oriented to customer-oriented, integrating all the data generated from every department, machine and etc. is critical. However, doing so is not easy because various silo systems of over 30 different S/W stacks are scattered and daily amount of data generation is huge. The number of data row is about 30 billion and the size is about 50TB. Therefore, Hadoop-based system is essential for collecting data from all of the source systems. 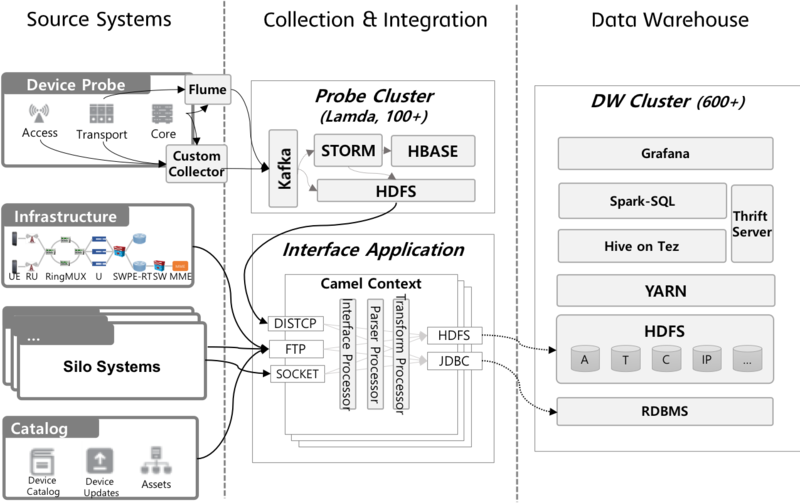 This system is composed with probe cluster, data warehouse cluster and interface application. Even with a massive data collection system, users did not know what to look for because customer information data were huge. To solve this question, we chose to build Customer Experience Index(CEI). CEI is a numerical value based on a 100-point scale which includes customer inconvenience factors while using mobile phones. However, building the index from big data is quite challenging. Creating CEI is a collection of workflows with more than 100 steps. For each step, we select ETL tools like Spark, Hive, or MapReduce. 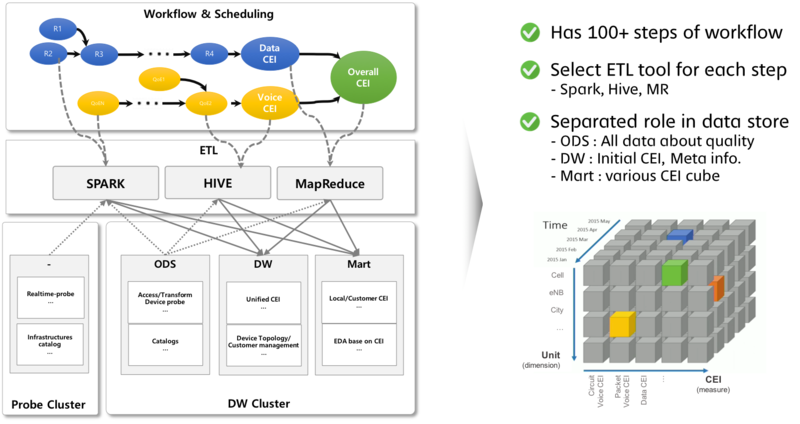 In data warehouse cluster, each data store has different roles. Finally, to ensure that the index reflects the customer experience better, we repeat the task of communicating the CEI results with the site every two years and repeat asking the site to go straight to the index and to modify it. However, new problems were revealed. Due to the increasing amount of CEI data, Excel could no longer be used for analysis. With CEI data, tens of millions of customer data gathered over the course of a 24-hour day, and the amount of data became greater over time. To properly analyze and visualize these data, customers have decided to leverage Business Intelligence solutions. The initial decision was Spotfire, a prominent global solution. However, depending on the role of the people in charge, they did not meet the requirements to share data authority, and there were frequent memory limitations for analyzing large data. We introduced Metatron Discovery, which utilizes the druid, a fast OLAP engine. Metatron was able to fully satisfy the requirements of the customer because it was made free and is easy to manage the rights of users, data and analytical work. It was faithfully built to support data governance policy also. It is a web GUI-based tool that allows non-IT professionals to perform data analysis on their own according to their specific needs.